Three of the longest-serving elite teams in the 7DAYS EuroCup and a team that never made the playoffs before this season will roll the dice in the semifinlas this week. 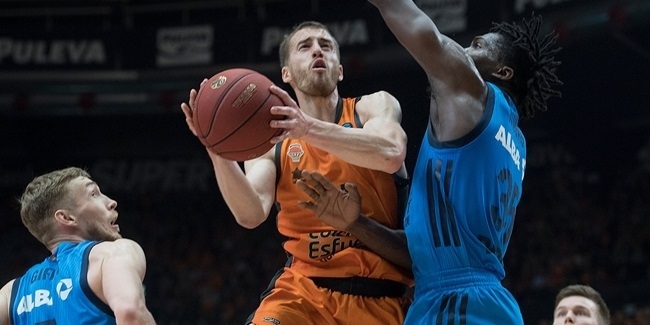 Valencia Basket and UNICS Kazan, boasting four titles between them, face off in one series. Former finalist ALBA Berlin goes against relative newcomer MoraBanc Andorra in the other. Here are some story angles to follow in Game 1 on Tuesday and Game 2 on Friday. After three of four 7DAYS EuroCup Quarterfinals went all the way to Game 3, we move on to the best-of-three semifinals, where in the past two seasons, only one series has featured a decisive third game. The team that won that series was Valencia Basket, which ousted Khimki Moscow Region in the 2017 semis. Valencia now meets another Russian rival, UNICS Kazan. These two teams previously met eight times in the EuroCup. Not only does Valencia hold a 5-3 advantage between them, but it swept UNICS in the home-and-away 2014 EuroCup Finals to lift its third title. Valencia also ousted UNICS a year earlier, in the 2013 quarterfinals, by 148-141 on aggregate. This is the first time they clash in the semifinals, however, and the first time in best-of-three series. Three-time champion Valencia has the home-court advantage as it tries to stop the 2011 champion, UNICS, for a third time in the EuroCup Playoffs. Meanwhile, ALBA Berlin and MoraBanc Andorra have never met in an official game before now. ALBA will try to return to the EuroCup Finals after nine years. MoraBanc is in just its second season in the competition, having played a total of 29 EuroCup games. ALBA ranks fourth all time with 169 games played, UNICS is second with 189 and Valencia is the all-time leader with 201 EuroCup games played. As such, MoraBanc is the definitive outsider here. That clash between Valencia and UNICS will be a true battle of the heavyweights, not just because they bring the two best overall records in the EuroCup this season. UNICS has a former EuroCup MVP, Erick McCollum, among three players won have won the title before. McCollum did so in 2016 with Galatasaray Istanbul; Jamar Smith won it in 2017 with Unicaja Malaga; and Maksim Sheleketo is a two-time champion, from 2013 with Lokomotiv Kuban Krasnodar and 2015 with Khimki. 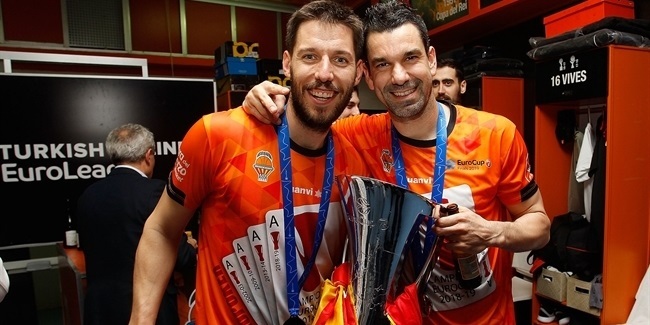 On the other side, Bojan Dubljevic, Sam Van Rossom and Rafa Martinez had all helped Valencia lift the title in 2014, and Martinez is also a two-time champ for having won it in 2010, as well. In addition, UNICS has three more players and Valencia five who have previously gone to the EuroCup Finals. In the other semifinal, ALBA's head coach Aito Garcia Reneses won the 2008 title with DKV Joventut and reached EuroCup Finals with Herbalife Gran Canaria in 2015. ALBA forward Luke Sikma helped Valencia reach the finals in 2017. Overall, the four semifinalists have a total of 15 different players and a coach who previously reached EuroCup Finals once, twice or three times (Sheleketo). They are all eager to get back to the finals again. ALBA Berlin's offense has reached historic heights through 19 games played this season. ALBA leads the EuroCup in assists and average performance index rating, while ranking second in points scored. ALBA's 22.9 assists is on pace to become a new record in competition history. Its average PIR of 102.3 is currently fifth all-time. ALBA's average of 87.8 points ranks second among this season, but first among teams that got past the regular season. That average is currently eighth in competition history, and no team in EuroCup history with more than 16 games has averaged more than 87.5 points before. ALBA also ranks second in both three-point accuracy (42.1%) and offensive rebounding (12.4 rpg.). That offense gets a boost from an opportunistic defense that ranks first in steals (8.8 spg.) and second in forced turnovers (15.7 per game). ALBA's offense has been like few that came before, but MoraBanc has been absolutely dominant on its home floor. When series moves to Andorra for Game 2 on Friday, MoraBanc will try to stay perfect in front of its fans, who have seen their team win all nine of its EuroCup home games this season. MoraBanc averages an impressive 93.7 points at home, second best this season and the most among playoff teams. What's more, MoraBanc has won those nine home games by an average margin of 10.7 points and scored at least 86 points in each, including a 98-79 drubbing of ASVEL in a must-win quarterfinals Game 2. All told, MoraBanc is 11-0 this season when it has scored more than 80 points, a run that continues after its 80-82 road win decided the quarterfinal series against ASVEL. Three teams have gone undefeated so far on their home floors, and all three are in the semifinals: MoraBanc, Valencia and UNICS. Out of those three, however, only Valencia has home-court advantage, and therefore the chance to stay perfect in Game 1 on Tuesday. Valencia also has an overall winning streak of 12 games, which with a victory on Tuesday would tie its club record in the competition. 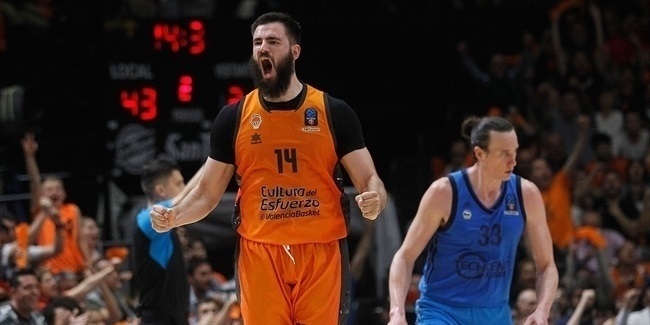 Interestingly, it is the third time in EuroCup history that Valencia has won 12 in a row... Valencia's star center, Bojan Dubljevic, needs one more defensive rebound to take sole possession of the first place on the all-time rebounding list. He enters Game 1 of the semifinals with 396, the same as Vladimir Veremeenko. UNICS's sharpshooter Jamar Smith can climb up the all-time charts, too. He currently sits in 10th place with 157 career three-point shots made. Alex Mumbru is ninth with 158, while David Logan (eighth, 160), Marko Marinovic (seventh, 164) and Demond Mallet (sixth, 167) are all within his reach in two games this week. Sikma will try to become only the third player in competition history averaging at least 6.8 rebounds and 4.3 assists, along with scoring in double digits (11.6 ppg.). He would join the company of DeAndre Kane and Donta Smith.